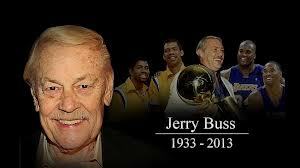 2/19/13 - The passing of longtime Los Angeles Lakers owner Dr. Jerry Buss has sent shockwaves throughout the City of Angels. Everyone that has worked with or for the Lakers owner has started to reflect on their relationship with Buss and the impact he’s had on them and on professional sports. After purchasing the Lakers back in 1979, Buss went on an amazing run leading the team to 10 NBA titles from ’79 to 2013. Buss was instrumental in the team’s success with a willingness to spend the money needed to bring in superstars and build rosters that were able to contend for titles on an annual basis. During his time as the owner of the Lakers, Buss brought in some of the most memorable players in NBA and franchise history with Magic Johnson, James Worthy, Shaquille O’Neal, Kobe Bryant and Pau Gasol leading the way. As arguably the greatest owner in team sports, Buss’ legend will live on and will remain the cornerstone of the storied franchise with Jeanie and Jim Buss carrying on his legacy. Dr. Buss has received tremendous support from players, coaches and owners around the league and will continue to be recognized as an important figure in the history of the NBA.